Beyond the confines of the tortilla factory lies a whole world of Bushwick taco options, and in the next few weeks we'll be exploring some of the neighborhood's best in a weekly feature. Our first stop is Mally's Deli & Grocery on Knickerbocker Avenue, an unassuming shop with a low-hanging awning and colorful photos of the food inside pasted to the bottom half of the windows. I go in there often, and when I'm not in there, I'm suggesting it as a quick and cheap meal to guests from out of town or out of the neighborhood, and invariably, I recommend the same taco: cecina, or salted beef. Slathered in sour cream, cilantro, onion, lime juice, and a generous spoonful of the spicy red salsa—if you're not a wimp—provides the perfect bite, and all of it is encased in a thick homemade tortilla. Getting the balance of flavors right in such a small vessel is no easy feat, but the cecina taco delivers on the saltiness of the beef juxtaposed against the bite of the onion, the freshness of the cilantro, and the creaminess of the sour cream that provides just enough glue to keep the whole thing together. There are four tables at Mally's for sitting down to a hearty meal in the restaurant along with some window seats for people watching. The television is always tuned to a sporting event with the volume down and music piping through the speakers which makes me feel like I could stay there forever, smelling every delicacy to come off of the grill in the back. But, if you don't want to make the trek out, they deliver quickly, too, but be sure to request the red salsa. You will not be disappointed. 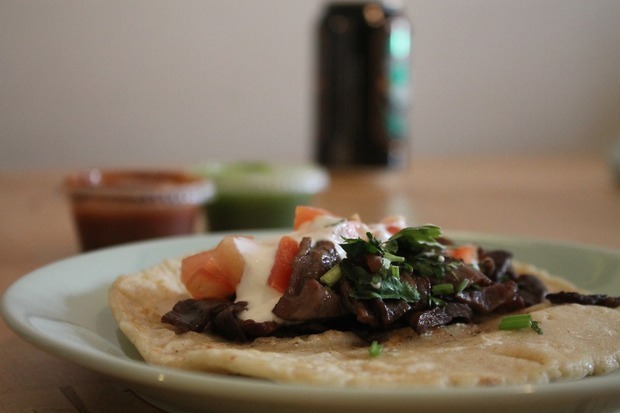 Homey spot with made-to-order tacos, burritos, tortas, and more. Featured image: cecina taco by Magdalena Waz for Bushwick Daily.